Add coffee, stir and leave to cool for 2 minutes. In a separate bowl, whisk the egg whites until soft peaks form. Add caster sugar and whisk further, until the peaks are stiff. Add a spoonful to the chocolate mixture and fold. Gently fold in the rest of the egg whites bit by bit until no white spots remain. Delicately scrape into a glass jug and pour into serving dishes. 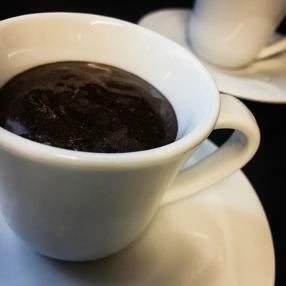 This mousse packs a punch so I tend to serve it in egg or espresso cups, which is 10 servings. If you want to make more generous portions the recipe produces approximately 1/2 litre of mousse.